Alexandria Villasenor doesn’t remember a world without climate change. When she was eight, Folsom Lake, the reservoir practically in her backyard in Davis, dried up amidst California’s epic drought. She peered at the dead fish on its former shores and felt her anxiety about the future start to grow. The 13 year old has since moved to New York, but she was back visiting friends and family in Davis recently when the Camp Fire struck 145km to the north. Smoke wafted over Northern California, creating the most toxic air on the planet. Fearing for her health, Villasenor left. And in that moment, she knew she couldn’t idly accept a future of ever-worsening drought, fires, and weather whiplash turning her home state into a climate change-fuelled wasteland. Villasenor can’t yet vote intransigent politicians out of office or run herself. But she found inspiration in Greta Thunberg, the 15 year old Swedish activist who began striking each Friday in the run up to Sweden’s September 2018 elections to protest inaction on climate change and who has inspired tens of thousands of youths across Europe to follow suit. 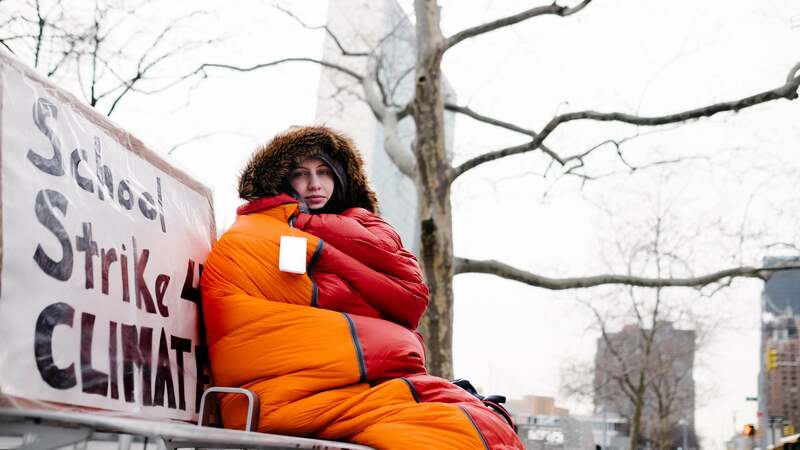 Eight weeks ago, Villasenor started walking to the United Nations in her own Friday climate strike, a tradition that continued this Friday in the face of polar vortex-fuelled cold. Now, she’s calling for a nationwide school strike on March 15 to talk about our future and send a message to adults to get their act together at this pivotal moment in history. Like Thunberg, Villansenor speaks in blunt terms. “If we’re not going to have a future, then school won’t matter any more,” Villasenor told Gizmodo, explaining why she hopes students across the country will take to the streets. Villasenor’s path to activism is both unique and all too common for her generation, which is growing up in a time where climate change’s impacts are increasing apparent and time is running out to radically transform the world’s economy to confront the crisis. Since Thunberg began striking in Sweden last August, huge numbers of students have taken up the cause under the banner of #fridaysforfuture as the movement has spread across social media. Students went on strike in Poland at last year’s major climate conference where Thunberg also spoke. In Australia, which is currently broiling under a blistering heat wave likely fuelled by climate change, an estimated 15,000 students went on strike in November. Just this Thursday, 45,000 students walked out of classes in Belgium. Yet in the U.S., despite its huge role in causing climate change, has seen just a smattering of strikers across the country since Villasenor began her protest at the U.N. She pointed to rigid U.S. values and fear of breaking from them as some reasons the student strike movement has yet to catch on here. But in her view, now is the time for rule breaking. “We now have to start being more direct. We’re not going to get anything done if we keep going by the rules,” she said. By setting a firm date of March 15, Villasenor said she hopes to galvanize a bigger, sustained movement. Student strikers in Australia and Europe have said they’ll be taking to the streets in solidarity, and Uganda and Thailand strikers are considering action as well. The organising is being done by a loose organisation of students who check in on regular calls as well as Twitter DMs and Facebook Messenger. But Villansenor said other climate activism groups are planning to show their support with direct actions, including 350, Extinction Rebellion, and the Sunrise Movement. The theme will be coming together collectively to reimagining our future and how to get there.